Wisdom teeth in located in the back four corners of your mouth. Usually they emerge around the age of 20. In many cases there is not enough space for wisdom teeth, and they can cause pain, infection and swelling. Removal of wisdom teeth can be the solutions for all these syndromes. Wisdom teeth can be removed by a dentist or in more complicated cases by a dental surgeon. The length and the type of the operation have to be analysed and need a tailor made decision. Wisdom teeth extraction is usually made under local anaesthetic. 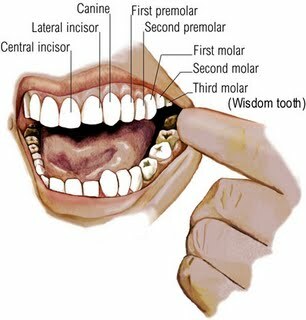 To reach the wisdom tooth, the dentist will cut your gum and maybe a part of your jawbone. In a simple case the operation wouldn't last longer than a couple of minutes, but in certain cases it might take up to 40 minutes to extract the teeth. Once the wisdom teeth are removed the doctor will close the wound with stitches. In the first time you will have to take extra care because of the side effects of anaesthetic and sedation. Your dentist will advise you what to do in case of pain. Stitches will be removed within about a week. WebMD has a great explanation of the procedure, check it out if you need more information. You can check out our prices here, wisdom tooth extractions start from £177 depending on the difficulty.